Quality: Excellent transfer to dvd-r. Sharp image and clear sound. 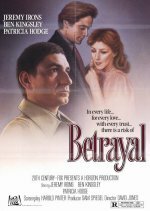 This film version of Harold Pinter's 1978 play has Patricia Hodge married to Ben Kingsley but having an affair with Jeremy Irons. The story, a sort of sexual charade, starts at the end and works backwards, dealing with a sequence of betrayals between the three friends. This was producer Sam Spiegel's final film, ending a distinguished career that encompassed such classics as On the Waterfront and Lawrence of Arabia.